From 32 degrees in Manila, Philippines to 12 degrees in Melbourne, Australia. That is the shocking difference in weather that 28 year-old Filipino boxer Richard Claveras of Bacolod will have to go through when his Air Asia flight D7214 finally lands in Melbourne at around 8:30 am Wednesday morning ahead for one of the most important battles of his life. Claveras (18-3-2, 15 KO's) gets to Australia to climb the ring against unbeaten Andrew "The Monster" Moloney (16-0, 10 KO's), a world-ranked boxer in all four boxing organizations and one of the most promising, highly-rated fighters in the Land Down Under. The Maloney-Claveras clash of civilizations will be for Moloney's WBA Oceania Super Flyweight belt this coming Saturday (May 19) at Malvern Town Hall in Melbourne. For the important battle, Claveras trained under the guidance of his loyal coach and travel companion Felix Tanamor, a former flyweight boxer who is confident in his pupil's ring experience (Claveras has been an active pro fighter since February of 2012), and his dangerous punching power, for which fans call him "The Explosive." The Filipino's training began in the Bacolod area in Western Visayas (Claveras is from nearby Silay City), and then in the Philippines' capital Manila at MP-Highland Boxing Gym where his main sparring partner was flyweight pro boxer Jeronil "The Diamond" Borres. Nevertheless, the Aussie Andrew "The Monster" Maloney -- twin brother of star bantamweight Jason Moloney -- is heavy favorite to retain his WBA Oceania 115 title, though in boxing anything is possible. Andrew Moloney's brother, Jason, will see action in the card's main event against veteran Japanese former 2-time world champion Kohei Kono (33-11-1, 14 KO's). "It will be Moloney's toughest test so far in his 16-fight career as Kono in my opinon is still dangerous. Kono had Rex Tso in trouble before the fight was stopped. "I am expecting fireworks in the Kohei Kono vs Jason Moloney fight as Jason is a good puncher who is aggressive. This has fight of year fight written all over it," said Peter Maniatis today. On fight night, the supervisor for the WBA will be as usual Francisco Martinez of Auckland, New Zealand. The exciting boxing card in Malvern, a suburb of Melbourne, Victoria, Australia, is a production of Hosking Promotions of promoter/matchmaker Lynden Hosking of Victoria in association with Ultratune and Australia National Hall of Famer Peter Maniatis. The live telecast for Australia will be on Fox Sports Australia starting at 6 PM Melbourne Time. For fans outside Australia, the promoter will air the live signal on Epicentre TV Stream. 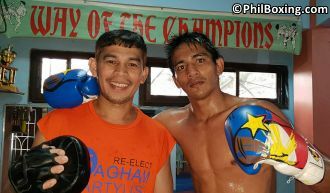 Photo: Richard Claveras and his coach Felix Tanamor during training at Highland-MP Boxing Gym.